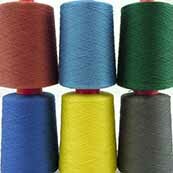 10/2 Perle Cotton is a lightweight cotton that comes in a wide range of colors. It is mercerized, so it has an elegant sheen and a smooth surface. This is the second lightest of the four weights of perle cotton that we carry, and is often used for napkins, scarves, fabric for clothing, and as the warp and tabby weft in overshot or summer and winter. The woven part of the fabric holds up well during washing, but the fringe can be vulnerable to deterioration from repeated washing and drying. For best results, use a braided or twisted fringe to make sure that the fringe looks as good as the rest of the fabric for the life of the piece. Hey, read this before you order: This yarn is sold by weight. Cone sizes vary on this item, but are generally between 1 and 1.5 pounds. The price per cone is calculated based on the actual weight of the cone. The price per pound is given next to the color name in pull-down box above. Because the cones typically weigh more than a pound, your order total will be higher than what you see on the checkout screen. Once the cones are weighed, your total will be calculated and a second charge will be made to your credit card if necessary. If you would like us to contact you with the total before we ship your order, please tell us in the box marked "Shipping Instructions" at checkout. Please enter the weight that you would like for the quantity and we will match the weight with available cones as closely as possible. Keep in mind that for larger orders, the number of cones will be different than the weight. (Five pounds is probably going to be on only four cones, for example.) If you have any special requirements as to the number of cones or need to know the total for the order before we ship it, please tell us in the box labeled "Shipping Instructions" during the checkout process. Need a smaller amount for an accent? Check out the 6 ounce minicones here.